MANAMA, Bahrain - Soldiers and riot police used tear gas and armored vehicles to drive out hundreds of anti-government protesters occupying a landmark square in Bahrain's capital, a day after emergency rule was imposed in the violence-wracked Gulf kingdom. Demonstrators said at least two people were killed. Witnesses said at least two protesters were killed, but there was no official word on casualties from authorities. The witnesses spoke on condition of anonymity because of fears of reprisals from officials. It was unclear whether the offensive included soldiers from other Gulf nations who were dispatched to help Bahrain's Sunni monarchy, which has been under relentless pressure from the country's majority Shiite Muslims to give up its monopoly on power. Protesters on Wednesday fled for cover into side streets and security forces blocked main roads into Manama. Mobile phones were apparently jammed in central Manama during the height of the attack and Internet service was at a crawl. In Shiite villages, people went to mosques to pray in a sign of protest against the Pearl Square crackdown. Others lit fires in anger. 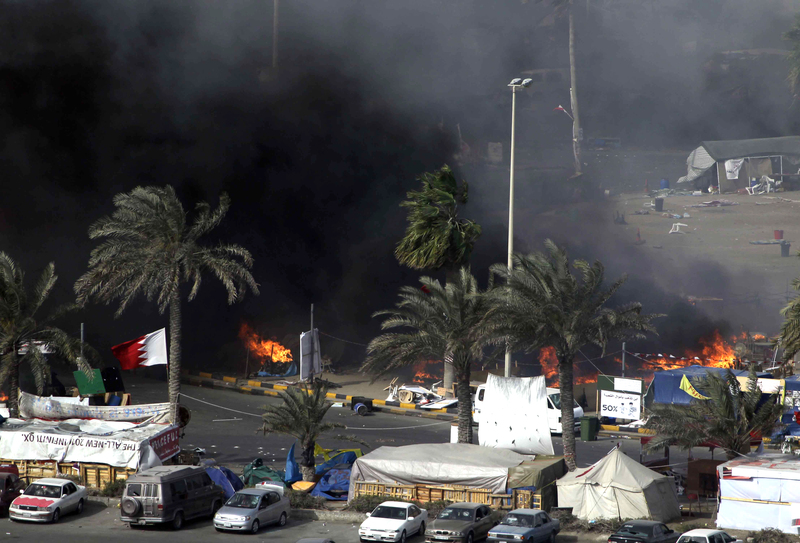 Clashes were reported in other mostly Shiite areas of the country. For Bahrain's authorities, clearing Pearl Square would be more of a symbolic blow against protesters than a strategic victory as opposition groups are still be able to mobilize marches and other actions against the leadership. Bahrain's king on Tuesday declared a three-month state of emergency and instructed the military to battle unrest in the strategic nation, which hosts the U.S. Navy's 5th Fleet. Shortly after the announcement, clashes erupted across the island nation, killing at least two civilians. Saudi officials also said one of its soldiers was killed. Bahrain's sectarian clash is increasingly viewed as an extension of the region's rivalries between the Gulf Arab leaders and Shiite powerhouse Iran. Washington, too, is pulled deeply into the Bahrain's conflict because of its key naval base  the Pentagon's main Gulf counterweight to Iran's growing military ambitions. On Tuesday, Iran and its allied force in Lebanon, Hezbollah, denounced the presence of foreign soldiers in Bahrain. Iran has no direct political links with Bahrain's main Shiite groups, but Iranian hard-liner in the past have called the tiny island nation that "14th Province" of the Islamic Republic. Gulf rulers, particularly Saudi Arabia, fear that the collapse of Bahrain's Sunni monarchy could embolden further revolts across the region and embolden the Saudi Shiite minority whose home region is connected to Bahrain by a causeway. The state of emergency in the U.S.-backed regime gives Bahrain's military chief wide authority to battle protesters demanding political reforms and equal rights for the majority Shiites. Also Tuesday, Secretary of State Hillary Rodham Clinton expressed alarm over "provocative acts and sectarian violence," and said she telephoned Saudi Foreign Minister Prince Saud to stress the need for the foreign forces to promote dialogue. "We call for calm and restraint on all sides in Bahrain," Clinton told reporters in Cairo, where she was urging on democratic currents that chased Egypt's Hosni Mubarak from power last month. Meanwhile, the Pentagon authorized military family members and civilians with non-emergency jobs to leave Bahrain as violence spread. The foreign troops are from the six-nation Gulf Cooperation Council's Peninsula Shield Force. The bloc is made up of Saudi Arabia, Oman, Kuwait, Bahrain, Qatar and the United Arab Emirates  all largely Sunni countries that have nervously watched the Arab world's protests. The Saudi government on Tuesday withdrew accreditation to the chief Reuters correspondent there, complaining about a recent report on a protest in the kingdom. Reuters stood by its coverage. Iran denounced the foreign intervention as "unacceptable" and predicted it would complicate the kingdom's political crisis. A senior Bahraini foreign affairs official, Hamad al-Amer, called the remarks "blatant intervention in internal Bahraini affairs" and said Iran's ambassador to Bahrain was summoned to the Foreign Ministry. A security official in Saudi Arabia said a Saudi sergeant was shot and killed by a protester in Bahrain's capital, Manama. No other details were immediately given on the death of the soldier, identified as Sgt. Ahmed al-Raddadi. The Saudi official spoke on condition of anonymity because he was not authorized to talk to the media.